William Ashton Ellis’s ‘handsome wreathe’ is the only tangible bridge between the genius and his admirer. It might never even have made it to the hallowed burial ground: ‘The bulk of the wreathes had been left behind at the station to be sent direct to the theatre, where they were still on view many years afterwards’. It can safely be said that Wilhelm Richard Wagner had never heard of William Ashton Ellis. Like Parsifal, Ellis witnessed a funereal ceremony from the wings, and would draw heavy inferences about how that ‘earthly journey’ should be interpreted. to pretend that the translation has not been an arduous task; but I can honestly say that it was not by reason of the unwonted difficulties often alleged to exist in the original. Any one who has a moderate knowledge of German, and is accustomed to thinking a little deeper than the ordinary light literature of the day, can read Wagner’s prose in the original, and profit by it. Wagner’s prose and light literature? It’s a statement that could only be made by someone with a confident, rather than moderate, knowledge of German, and with an intrinsic habit of deep thinking. Perhaps it’s well-intentioned, urging readers to approach Wagner’s prose in the original. But it knows all along that those it flatters, those sensible people with their moderate knowledge of German, are in fact waiting for ‘the original’ to be served up to them in digestible form. The implication is that this task should fall to someone ready and able to do what Thomas Carlyle did for Goethe (and who would happily accept the charge of epigonism). the same difficulty exists in every attempt to render faithfully and readably into English any of the more serious products of German literature. However rich our own language may be, we have to depend, for philosophic and aesthetic terms, too much upon words of Greek or Latin derivation; whereas the German classic has at his disposal words that have sprung from the spirit of the language, words that, however philosophically used, have still a direct relation with what may be called concrete - as opposed to abstract - modes of thought. The difficulty, therefore, is to translate these expressions into terms that shall not be so conventional as to rob them of their vital play of meaning. That unexpectedly quaint turn of phrase (‘a pepper-box of commas’) marks him out as a late-Victorian eccentric. He’s apologetic for the limitations of his own language, but he has chosen to apply it to the elaboration of a deeper ‘German’, a ‘philosophic’ message. Few nowadays appreciate the ironic rhapsodies of Thomas Carlyle’s pseudo-biographic Professor Teufelsdröckh in Sartor Resartis, who inhabits a vaguely similar intellectual world. Even fewer are likely to be drawn to William Ashton Ellis’s stylistic idiosyncrasies. An aura appears, of course, at the edge of an object. In fact it’s usually detectable only after direct contact with the object has been lost. The present study makes no claims for any centrality to Wagner scholarship. In more than one sense it focuses not on the original but on the translation. It takes in peripheral, curious, and downright unfashionable aspects of Wagner’s reception in Britain. I'm afraid it indulges in Ellis’s own predilection for pregnant footnotes, especially in poignant details unearthed from death certificates, census returns and other secondary sources (dug out diligently at the time of my first researches, but many now accessible and verifiable on-line). In this scaled-down lens I hope that William Ashton Ellis’s much-disparaged attempt at an English ‘equivalence’ of Wagner’s writings can in fact be seen to disclose some valuable conceptual and receptive issues. The urge of successive generations to condition Wagner needs to be examined in its own right. After he ceased to speak for himself, ‘Wagner’ came to us through the mediation of his successors, hagiographic or hostile, scholarly or dilettante, over the last two hundred years. We have lost direct contact with Wagner and are left with ‘interpretation’, of which translation is a pretty violent form. Patrice Chéreau’s 1976 centenary production of the Ring at Bayreuth is universally accepted as a dramaturgical watershed. More or less self consciously (usually more), productions since then have had to seek new modes of interpretation and expression. Engagement with, or antagonism towards, the audience has become increasingly commonplace, not least at Bayreuth. Over the decades we have had continually to ‘invent’ our relationship with Wagner, to seek an ‘equivalence’ for our times. Patrick Carnegy has documented the always unsatisfying but endlessly absorbing dichotomy between Werktreue and Regietheater. Wagner’s work now calls for invention (or intervention) beyond the stage. Over the decades Fritz Lang, Hans Jürgen Syberberg and Bill Viola, in film or video, have offered entertainment with or without offence along the way. Video backdrop or front-screen projections are now almost de rigeur; more multimedia experiment can (and should) be expected on-stage and off. And Wagner himself has become opera, as in the late Jonathan Harvey’s buddhistic Wagner Dream of 2007. Wagner-biography has sought to make its mark as a literary genre with degrees of psychologising or politicising, from Nietzsche and Ferdinand Praeger, to Martin Gregor-Dellin and Joachim Köhler. For most of the twentieth century ‘Wagner literature’ – the serious prose by, after and about Wagner – resided off the stage, off the screen, and on the higher shelves of the critic’s library, or in condensed or selective texts in programme-notes. But in the twenty-first century there has been a growing number of attempts to grapple with Wagner’s prose writings. The premise now is that whatever Wagner wished us to read about his ambition can’t be ignored in any appraisal of his achievement. Most artists would probably wish this. Ernest Newman made it clear as early as 1914 that the man can’t be separated from the artist. But the sheer shelf-space of the prose Wagner produced, and the primary and secondary biographical and exegetical material left in its train, has made this an extraordinary challenge. And this is before taking into account the tragic subsequent, or rather retrospective, historical context that Wagner couldn’t possibly have imagined, however much his genes (or Cosima’s, or Winifred’s) contributed to it. Given the shelf-space, almost all concert-goers and probably most opera goers seem to be content with the performances, if not the dramaturgy. Those who go to boo at Bayreuth are also highly privileged. But for stay-at-home English language readers, with enough shelf-space, William Ashton Ellis remains unique – or possibly heroically alone – in his determination to deliver unto us the exhaustive translation and propagation of Wagner’s prose opera as something no less essential than the mises-en-scène or the Life. Ellis’s eight-volume translation of Wagner’s Prose Works, as Stewart Spencer said, ‘for all its waywardness, remains the standard English version of Wagner’s writings in prose. No new translation of the complete writings is planned at the time of going to press.’  This is as true now as it was in 1992. John Deathridge’s ‘Checklist of Writings’ in the Wagner Handbook dutifully cross-referenced the Sämtliche Schriften und Dichtungen with ‘the standard English translation of Wagner’s prose works (Ellis)’. Ellis’s volumes were reprinted in their entirety in the USA in 1967 and 1972. In 1964, Albert Goldman and Evert Sprinchorn brought out a selection of extracts under the title Wagner on Music and Drama, the publishers on both sides of the Atlantic attributing the translation through several reprints to one H. Ashton Ellis. The 1991 English edition of Dieter Borchmeyer’s authoritatively exegetical Richard Wagner, Theory and Theatre, however, was resolutely anti-Ellis. Its translator (Stewart Spencer again) informed the reader that ‘All the passages from Wagner’s prose writings have been newly translated, although earlier versions have occasionally been consulted and plundered where appropriate. Little would have been served, however, by including references to Ashton Ellis’s eight-volume translation of the Prose Works (London, 1892-9), a translation as unedifying as it is unobtainable.’  This verdict somehow failed to deter the University of Nebraska Press from launching in 1994-96 a paperback reprint of Ellis’s eight volumes, re-titled but otherwise unchanged, with a cover blurb describing him as ‘one of the most important translators of nineteenth-century musicology’ [sic]. Despite better-informed opinion there seems to persist in the English-speaking world a need for a ‘standard’ complete English translation of Wagner’s prose works. And for the time being William Ashton Ellis’s still seems to serve, even if we know little about the man who provided it. Newman clearly meant that to be the last word on Ellis, by then dead for seventeen years. Ellis had been aged thirty when Wagner died. He was in his early twenties when he was first struck by the phenomenon of the composer, but it was only after Wagner’s death that Ellis’s lifelong mission began. What John Deathridge called the ‘aura’, Ellis found to be in everything that had come from the composer’s hand and mind. Few could now share his blasé view of Wagner as not merely ‘the greatest composer of dramatic music ever born’ but ‘a philosopher and aesthetician’ whose - not theories, not conclusions, but – ‘opinions, whether they be eventually accepted or not, are pregnant with deep meaning.’  All that Wagner did, said or wrote was taken by Ellis to be conducive to that whole ‘deep meaning’, and deserving therefore of wider communication through translation. The structure Ellis chose for his English version of the composer’s Prose Works was logical enough; the determination and consistency with which he realised the project was impressive, though it was the only large-scale endeavour which Ellis was to see through from conception to completion. It was interwoven with commentaries in The Meister (out of which it grew), and with independent studies and articles; ultimately it underpinned the edifice of Ellis’s later (uncompleted) Life of Richard Wagner. 1899	translates Richard Wagner: Letters to Wesendonck et al. This literary output  began after the formative ages of nineteen to twenty-six during which Ellis trained as a surgeon and physician and the next nine years in which he practised that profession. There is clear evidence of his commitment to and ability in his profession. Yet he resigned his medical post in 1887, and from that year forward until 1915, his career as a physician gave way to Wagner-translation, biography and propagandising. As for his own biographical details, the man was an enigma. Ellis was coy even about his age. Until the appearance of the first version of the present study in 1993, no commentator knew the true date of William Ashton Ellis’s birth. Ellis was an infant when Wagner conducted for the Old Philharmonic Society in London from March to June 1855. He was trained for and accomplished in the medical profession, but seems to have become self-made in the arts. He does not reveal when and how he acquired his German, and he was to describe his musical knowledge - probably with false modesty - as amateur. He was a medical student during Wagner’s Albert Hall concert ‘festival’ in May 1877, and only on the fringe of an older generation of Wagner-acolytes in London who actually glad-handed the great man. He never did meet Wagner, but he felt himself to be his first genuinely English (as opposed to expatriate German) exponent. He never married, never had children. He was a member of the Theosophical Society, but no member of that or any other society seems to have claimed to be his friend. Outside the London Wagner Society, he never mixed in ‘society’. Until now no photograph of him has been discovered, though he himself was an amateur photographer. The autographs of his writings appear to have vanished. His Wagnerian endeavours met with only qualified appreciation by his most sympathetic contemporaries, Bernard Shaw, David Irvine and Houston Stewart Chamberlain, and the next generation, in particular Ernest Newman, William Wallace and W.H. Hadow, took critical, if not scornful, issue with them. Ellis felt betrayed by unacknowledged borrowings made by others from his work, and by younger writers who went on from where he had left off. He rejoiced in the growth of Wagner’s popularity in London in the 1890s and in the artistic and financial consolidation of the Bayreuth Festivals under Cosima and Siegfried Wagner, then saw it all collapse with the onset of war between Britain and Germany. He was realistic enough not to expect his writings on Wagner to be remunerative, and George Bernard Shaw was compassionate enough to argue for a Civil List pension for him. After war broke out Ellis returned to his former medical post, perhaps as much out of financial need as for humanitarian reasons. He died in his rooms at the Western Dispensary, having suffered the removal of his piano and books in order to make way for an air raid shelter, and at odds with his staff. So who was he? On 5 August 1845, Robert Ellis married Mary Ann Eliza Uther, two years his senior, and living next door to his lodgings. Her father Charles Bagley Uther had risen in 1819 from foreman to owner of the famous London gunmakers’ firm of Alexander Forsyth & Co. With his daughter and son, Charles William Anthony Uther, he now occupied the firm’s premises at 8 Leicester Street, Leicester Square, Soho, after its founder retreated to enjoy his renown in his native Aberdeenshire. Despite the bridegroom’s Welsh origin, the marriage of Robert Ellis and Mary Ann Eliza Uther was performed according to the rites and ceremonies of the established church of England and Ireland. And despite his scientific career Robert Ellis was to display a typically mid-Victorian deference towards the God of that church. At the time of his marriage, Robert Ellis was living at 59 Brompton Crescent, practising as surgeon and ‘accoucheur’ to the Chelsea, Brompton and Belgrave Dispensary at 41 Sloane Square. 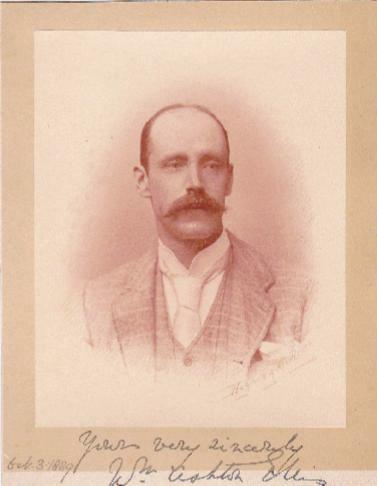 His first child, Robert Uther, was born on 26 April 1847, but by the time a daughter, Ada Matilda, arrived in 1849 the family had moved nearer the dispensary, to 63 Sloane Street. Robert Ellis had evidently begun to enjoy success. He became a regular attender at St Saviour’s on Walton Street, where all his children would be christened. Henry Holland’s neoclassical Sloane Street was a favoured location for the professional middle class. No fewer than ten medical practitioners had addresses there during the 1850s. Most notably at number 62, next to the Ellis family across Hans Street which intervened, there was born and lived Francis Seymour Haden. Haden, whose no less famous surgeon father had introduced the stethoscope to England, ran a large private practice at 62 Sloane Street from 1847 to 1878, almost exactly the same period as Robert Ellis’s occupation of number 63. An early champion of ovariotomy, Haden became renowned not only as a surgeon. In 1875, in a series of letters to The Times, he advocated ‘Earth to Earth’ burial using papier mâche coffins, and attacked the proponents of cremation on grounds of cost and hygiene. He eventually gave up surgery in 1887 to pursue an even better-known career as an artist, becoming knighted and President of the Society of Painter Etchers. The occupation of surgeon was by now thoroughly respectable, and, if successful enough, permitted some interesting sidelines. In 1848 Robert Ellis had approached the Society for Promoting Christian Knowledge with a proposal to contribute a ‘Chemical History of Vegetation’. The Society recorded that it ‘Read a letter from Mr. Robt. Ellis offering to write a book or a series of books upon subjects connected with Natural History and Philosophy. Mr. Ellis forwarded a prospectus of a work “The Life of a Tree,” together with Specimens of Articles written by him and published in Chambers’ Edinburgh Magazine. / Mr. Ellis’s prospectus was approved and it was Agreed That he be encouraged to proceed with the proposed work.’  The work eventually published by the S.P.C.K. was The Chemistry of Creation: being an outline of the chemistries of the earth, the air, the ocean, etc. Ellis had contacted the photographic pioneer W.H. Fox Talbot (1800-1877) about the possibility of including ‘Talbotype’ (or Calotype) illustrations ‘as an aid to the faithful representation of Geological structure’ in his book. I feel much obliged by your polite answer to my note. I can at once state that highly though the Talbotype process would be valued by me as an aid to the faithful representation of Geological structure, the proposal to employ it for this purpose is wholly my own, being simply anxious to make the views scientifically accurate. I feel therefore that it would be impossible – especially as the art is to be only indirectly employed, & artists to reduce, & correct the sketches have to be paid just as much as if the sketches had been taken by the pencil by my own hand – to offer any pecuniary equivalent for permission to use the Talbotype process. This society does not feel at all anxious for the use of photographic originals: and it would be consequently in vain to [illegible deletion] expect that a licence for using the Talbotype would be sanctioned by their committee. The whole proposition came from me, & the responsibility of its success rests entirely upon me. I hope I distinctly expressed myself that the views themselves are not to be introduced. Messrs Henneman & Malone having stated in their prospectus that amateurs could pursue this beautiful art for their own amusement; I felt that for the purposes of science it would be equally freely available. The volume is only intended to be a small contribution to popular science, and would contain many sketches taken by pencil as well as by the sunbeam. As I am shortly about to leave England, I should consider a favor if you would kindly reply to this communication by an early post. As Ellis foresaw, the S.P.C.K. proved unwilling to pay Fox Talbot for a patent licence, and Fox Talbot was evidently unwilling to grant Ellis an individual concession. The Chemistry of Creation appeared in 1850 with simple line drawings and engravings. A child can never be too early, nor too diligently, instructed in that fear of the Lord which has been so beautifully described as “the beginning of wisdom,” or in all the moral duties it enforces. [...] However great may be our power of opening up a child’s mind, and filling it at a very early age with premature wisdom, we are powerless as regards its heart, save as instruments in His hands who alone can open that wild and wayward casket of the soul. WANTED, a NURSE and a HOUSEMAID, in a Christian family. The nurse must be able to take a baby from the month and have tact in managing children. The housemaid must be cleanly and active in her duties, and be able to wait at table. Both must be good needlewomen. The nurse to apply this day, and the housemaid on Monday at 63 Sloane-street, S.W., from 2 to 5 p.m. In 1862 The Lancet printed Robert Ellis’s letter to the editor on ‘The effects of railway travelling upon uterine diseases’: ‘So decided is my opinion of the injury likely to be inflicted by railway motion upon women who are suffering from uterine disorder, that I have refused permission to persons coming up to town for consultation to return again the same day.’  Ellis was elected a Fellow of the Obstetrical Society of London in 1861, and through the 1860s both The Lancet and the Transactions of the Obstetrical Society would report on and illustrate his innovative devices and procedures. In 1866 there appeared an 80-page treatise On the Safe Abolition of Pain in Labour and Surgical Operations by Anæsthesia with Mixed Vapours with woodcut illustrations of ‘Mr. Robt. Ellis’s Compound Inhaler’. His mixture - alcohol, chloroform and ether - remained in use as ‘A.C.E.’ until the 1920s. Robert Ellis, described on his title-pages as sometime Fellow of the Linnean Society, and Surgeon to the National Society’s Training Institution for Schoolmistresses and to the Hans Town Industrial School,  was obviously more than a mere sawbones. But Robert Ellis’s professional specialisation was obstetrics. Practical results of this can be seen in the measured spacing of the births of all nine of his surviving children: Robert Uther (1847-1921), Ada Matilda (1849-1936), William Ashton (1852-1919), Ernest Charles (1854-1921), Reginald Henry Uther (1857-1926), Douglas Uther (1859-1898), Florence Mabel (1861-1916), Evelyn Campbell (1865-1920) and Claude Bertram (1867-1919). There had been one loss. The Times of 10 April 1860 reported the death, ‘On Good Friday afternoon, [of] Florence Mary, the beloved child of Robert Ellis, Esq., of 63 Sloane-street, aged 4 years.’ Florence Mary Ellis succumbed on 6 April 1860 to meningitis, which her father had diagnosed fourteen days earlier. Charles Bagley Uther was present in the Ellis household at 63 Sloane Street during the census of 1851, and since Forsyth & Co. ceased trading at Leicester Street the following year he must have relocated there from the old premises above the shop. Uther died there from phthisis (tuberculosis) aged 78, in the presence of his surgeon son-in-law, on 20 May 1860. For the the young William Ashton Ellis the loss of his four-year-old sister Florence Mary a month earlier was the first of a series of encounters with mortality. Florence’s death had been registered not by her surgeon father, but by ‘Robert Ellis Sen.r in attendance’. The paternal grandfather gave his address as 1 Walton Place, Chelsea. Born in Ruthin in 1797, he may have come to London to support his son Robert junior in this first family crisis, but the 1861 census recorded him as resident nearby at 1 Walton Place as a widower and ‘retired gen. merchant’. Another son, Charles G. Ellis, 34, a solicitor, also born in Ruthin, was with him, and there was a boarder, Charles Uther, 29, described as a ‘fund holder’. Though there is a date discrepancy if this age is true, he was most likely Charles Bagley Uther’s son Charles William Anthony Uther. The death of yet another brother to Robert Ellis the younger, was announced in The Times on 9 January 1861: ‘On the 5th inst., aged 22, of acute bronchitis, Francis Edgar, youngest son of Robert Ellis, Esq., of No. 1, Walton-place, Chelsea, and Glan-ŷ-don, Rhyl.’ (The death was registered in Aston, Warwickshire.) Robert Ellis senior would be the subject of two other notices in The Times. On 4 December 1862, the marriage was reported, ‘On the 26th Nov., at St. Luke’s Church, Chelsea, by the Rev. Francis Synge, [of] Robert Ellis, Esq., of 1, Walton-place, and Glan-y-don, Rhyl, to Susan Campbell, of Glebelands, Mitcham, Surrey.’ Then on 8 November 1867, the death, ‘On the 5th inst., at 1, Walton-place, Hans-place, Chelsea, [of] ROBERT ELLIS, Esq., late of Ruthin, North Wales, aged 70. Friends will be so kind as to accept this intimation.’ The cause of death was certified as ‘bronchitis 10 days, laryngitis 5 days, exhaustion.’ By the age of 15, William Ashton Ellis had lost a sister, a couple of uncles, and both grandfathers. Mary Ann Eliza Ellis does not disclose her side of things. She does not emerge from history, not even as dedicatee of any of Robert Ellis’s writings; she may in fact have been treated shamefully, as we shall see. But the Uther line left its impression. Three of Robert Ellis’s sons bore their mother’s maiden name among their Christian-names, though not the third child born to Mary Ann Eliza Ellis on 20 August 1852 in the family home. In the Parish church of St Saviour, Upper Chelsea, he was baptised William Ashton Ellis on 8 December. Since there was no rush to perform the ceremony, it can be taken he was a healthy infant. Twelve years later, master William Ashton Ellis was entered at Westminster School. Robert Ellis found that after all he had an ‘extraordinarily clever child’ on his hands. William successfully examined to become one of the forty Queen’s Scholars at St Peter’s College (as the school is otherwise known) in 1867. His brothers Ernest Charles, Reginald Uther and Douglas Uther would also be taught at Westminster, but none showed the same scholastic promise as William. His father’s example beckoned. After leaving Westminster School in December 1870, William entered the medical school at St George’s Hospital at Hyde Park Corner on 1 May 1871, where in August the next year he won the Governors’ Prize of ten guineas for general proficiency among first year medical students. He would have been a day scholar: in the 1871 census Robert and Mary Ann Eliza Ellis would still be recorded at 63 Sloane Street, Chelsea, together with all their children save the eldest (Robert Uther Ellis, now aged 24 and about to be married); not to mention a cook, head nurse, under-nurse, upper housemaid, under-housemaid, footman, and boarder. Dannreuther himself founded the first London Wagner Society in 1872. It grew out of a ‘Working Men’s Society’ formed in the 1860s to promote the ‘music of the future’ chiefly represented at the time by Liszt and Berlioz. The first of a series of concerts of Wagner’s music took place on 19 February 1873. The organisers were ‘working men’ in the sense that they refused to be complacent consumers of conservative art, but were musical practitioners, teachers, theorists and critics who wished to associate themselves with the most advanced European music. They would transfer their allegiance to successive societies promoting progressive music, including successive Wagner Societies. Many were serious musical establishment figures who were prepared to risk controversy and put their academic and professional reputation on the line. Edward Dannreuther’s energetic relationship with Wagner – undiminished by the distance between London and Bayreuth - was remarkable. It was he who, with Alfred Forman, found a London theatrical property master to provide the stage dragon – or at least most of it – and other fauna for the Bayreuth Ring-premiere in 1876. He was the celebrity’s host during Wagner’s 1877 Albert Hall conducting season, and was instrumental in its arrangements, and in making subsequent financial amends for it. It was in Dannreuther’s Bayswater home that Wagner read the completed Parsifal-poem publicly for the first time. At Wagner’s request Dannreuther found a London manufacturer or importer of Chinese tam-tams to provide the (unsuccessfully) tuned resonances for Bayreuth’s Parsifal bells in 1882. He was a practical ‘working man’ who could turn his hand to teaching (pupils including Hubert Parry), performing (not least the British premiere of Tchaikovsky’s first piano concerto), and making scholarly contributions to Grove’s Dictionary  and the Oxford History of Music. A number of PATRONATSCHEINE, at 300 thalers each, for the Three Complete Representations of “DER RING DES NIBELUNGEN” (Rheingold, Walküre, Siegfried, Götterdämmerung), which are to take place at Bayreuth in the summer of 1873 [sic], have been secured. They will be divided amongst the members so that each may have a first-rate seat for one entire performance of the work, i.e. four consecutive evenings, at the cost of £15. Members will have special privileges at the series of orchestral concerts, under the direction of Mr. Edward Dannreuther, to be given by the Society next January, for the introduction of important compositions by Wagner, Liszt, Berlioz, Schubert, and Joachim. FOREIGN SECRETARY – Dr. Franz Hüffer. TREASURER – J.S. Bergheim, Esq. We learn that Lord Lindsay, the President of the Wagner Society, and other members of the Committee, along with Mr. Dannreuther, the conductor of the concerts of 1873 and 1874, have resolved to raise a fund to present the composer with an adequate testimonial. They have taken this step in order to carry out that principle on which the association was based – namely, to assist Herr Wagner to establish the National Opera-House at Bayreuth. It is no secret, and its is to be regretted even by those professors and amateurs who do not concur with him in his views of the lyric drama, that Herr Wagner has been suffering severely under the load of the deficit at Bayreuth, and that the recent concerts at the Royal Albert Hall have been of little service to him. He is in ignorance of the present movement of his friends and admirers, who believe that the proposed testimonial is the only way of securing for him the leisure and rest necessary for the development of his creative powers. – Athenæum. And one of those strangers at the apotheosis was William Ashton Ellis. Dannreuther’s original London Wagner Society was reconstituted in 1884 as the London branch (‘Zweigverein’) of the Universal or United Wagner Society (Allgemeiner Richard Wagner-Verein), whose central committee was then based in Munich. It’s not clear whether the old London Society retained any real function between Dannreuther’s last concert in May 1874 and Lord Lindsay’s death in December 1880. It was to (moneyed) society at large that Dannreuther had appealed after the Albert Hall embarrassment of 1877, and Hueffer was surely right when he said that the first Society had ‘existed essentially, like Schumann’s Davidsbund, in the head of its founder and musical director, Mr. Edward Dannreuther, to whom the present writer served as humble literary adviser and amanuensis.’  In 1884 the founding secretary of the new London Branch of the United Wagner Society was the lawyer and amateur musician B. L. Mosely. How Mosely had come by this appointment is uncertain. It’s probable that like Julius Cyriax he met Wagner in London during his Albert Hall ‘Festival’ in May 1877. Cosima’s Diary records that Wagner wrote to both Cyriax and a Herr Mosely on 3 June 1879. The editors of both the German and English editions of her Diary refer at this point to a letter in the Wahnfried archive from a ‘Dr. L. Mosely’. In fact the letter to which Wagner replied, though in cursive German script, is clearly signed by B.L. Mosely, sent from his barristers’ chambers at 2 Brick Court, Temple, London, on 18 May 1879. The Wagner-Briefe-Verzeichnis lists three letters from Wagner to Mosely between 1877 and 1881: one is accessible in the Richard-Wagner-Museum. Their correspondence appears to have been of little significance, Mosely mainly sending obsequious greetings (and at least one gift) on the occasion of Wagner’s birthday. UNITED RICHARD WAGNER SOCIETY of GERMANY. – LONDON BRANCH. – A branch of the above Society, under the presidency of the Right Honourable the Earl of Dysart, is in the course of formation, with the object of providing funds to defray the expenses of future representations of Wagner’s Music Dramas at Bayreuth; likewise to furnish poor musicians with the means of attending such representations free of cost, and generally to develop a taste for the works of that composer by combining his adherents in one organisation. The Annual subscription for Members is 10s. They will be entitled to attend and vote at the general meetings of the United Wagner Society as well as those of the Branch Society. The “Bayreuther Blätter,” the organ of the Society, will be issued to them at the modest rate charge of 6s. per annum, and tickets of admission for prospective performances at Bayreuth will be offered to them at reduced rates should the Society’s funds permit.